Residents of Dallas and Plano are in for an educational and riveting evening, Saturday evening, Sept. 20, when Blake Orth of Plano will share his experience as a “Lone Soldier,” who served in the Israeli Defense Forces in “Operation Protective Edge” in Gaza this past summer. Blake’s presentation will be held at Congregation Nishmat Am, 2113 W. Spring Creek Parkway, as part of its Selichot program. Blake is the son of Erik and Brenda Orth, who are members of Congregation Nishmat Am. Blake moved to Israel in 2013, and joined the IDF in April following his arrival there. He is now an Israeli citizen and a member of a Paratrooper Brigade. The term, “Lone Soldier” is designated for those members of the IDF who are not natives of Israel, but have come to serve from another country. Blake is now on leave and will give a firsthand account of this past summer’s conflict from a soldier’s point of view. On Sept. 22, he will return to Israel to re-join his unit. The program begins at 9 p.m. and is open to the public at no charge. Traditional Selichot services led by Rabbi Yitzchak Cohen and by Cantor Jacob Cohen will take place at 10 p.m., following Blake’s presentation. Lakehill Preparatory School is proud to announce that senior Rachel Drazner, daughter of Laurie and Mark Drazner, and Park Cities resident, has been awarded the distinguished honor of National Merit Semifinalist for the Class of 2015. Approximately 1.4 million juniors in more than 22,000 high schools across the country entered the 2015 National Merit Program by taking the 2013 Preliminary SAT/National Merit Scholarship Qualifying Test (PSAT). The nationwide pool of Semifinalists, which represents less than 1 percent of U.S. high school seniors, includes the highest scoring entrants in each state. These academically talented high school seniors have an opportunity to advance in the competition for National Merit Scholarships, with a combined worth of more than $33 million, that will be offered next spring. From left, Bnai Zion Texas Region Executive Director Avrille Harris, Covenant Church Colleyville Campus Pastors Cyd and Ricky Texada and Bnai Zion Texas Region President Diane Benjamin at the Sept. 7 Restored Hope Ministries event. 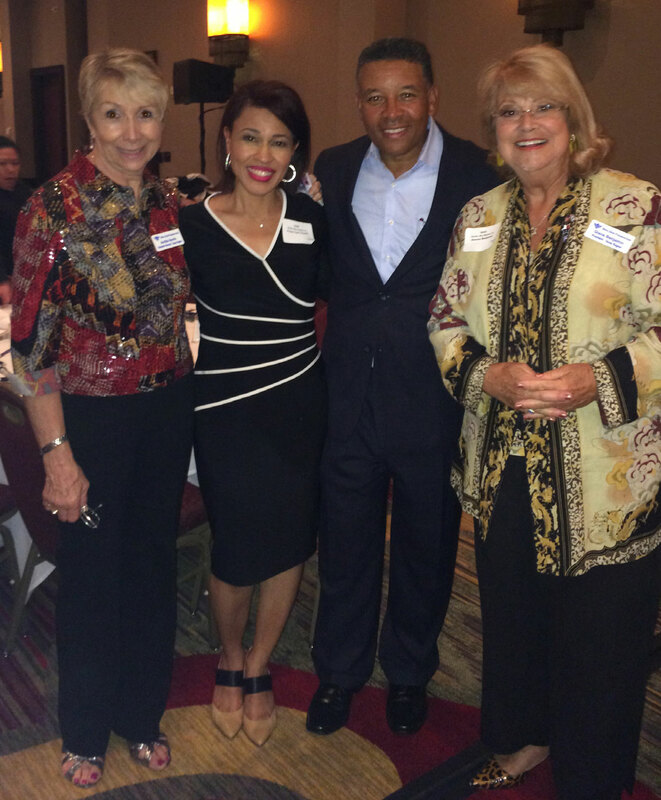 On Sunday, Sept. 7, Bnai Zion Texas Region President Diane Benjamin, and Texas Region Executive Director Avrille Harris, attended Pastor Sam Pollinzi’s event for Restored Hope Ministry, where they were given the opportunity to promote the annual Bnai Zion Texas Region Gala on Nov. 9. More than 600 people attended Pastor Pollinzi’s event including pastors from Covenant Church’s Colleyville Campus as well as others. Pastor Pollinzi spoke about Israel and the safety of the Jewish people. Following his speech, he invited Harris to explain the priority of the premier project of the Bnai Zion Foundation (www.bnaizion.org), which will be the construction of a new protected underground Emergency Department at the Bnai Zion Medical Center in Haifa, Israel. “With al-Qaida at the Syrian border, and Hezbollah continuing to arm Lebanon, the Medical Center must be prepared to save lives. Plans for the new protected emergency facility have been completed, and the hospital will begin to build; however, outside contributions are vital to finish this project,” Avrille emphasized. Proceeds from the gala are being earmarked for this purpose. Many of the pastors attending the event are familiar with Bnai Zion and support its life-transforming work in Israel. Avrille was assured by many of those attending the Restored Hope Ministry event that they would try to obtain tables at the upcoming Bnai Zion Gala, where Jaime A. Davidson, M.D., FACP, MACE, and a clinical professor of medicine at the Touchstone Diabetes Center at the University of Texas Southwestern Medical Center, will receive the Bnai Zion Distinguished Humanitarian Award in recognition of his work in diabetes as well as global diabetes education programs. Previous recipients of this award have included Dr. Stephen Swisher, Dr. Craig Rosenfeld, Dr. Brian Cohen, Dr. David Genecov, Dr. and Mrs. Tim Shepherd, Herb and Donna Weitzman, Pastors Mike and Kathy Hayes, Pastors Larry and Tiz Huch and other prominent individuals in the Dallas community. Michael Medved, nationally syndicated radio host, best-selling author and veteran film critic, will be the featured speaker at the event. A frequent guest on many TV talk shows, Medved writes a column for USA Today, where he serves as a member of the board of contributors. Ynette Hogue and Janice Pullman are the gala co-chairpersons. Bnai Zion, in its existence of 106 years, supports humanitarian projects in Israel that improve the lives of thousands in need across the religious, ethnic and economic spectrum. Its projects in medical, educational, social service and cultural areas transform and strengthen Israeli society. One hundred percent of all designated gifts to Bnai Zion are transferred to its projects in Israel. For additional information and sponsorship opportunities, please contact Avrille Harris, at 972-918-9200 or email avrille.harris-cohen@bnaizion.org.